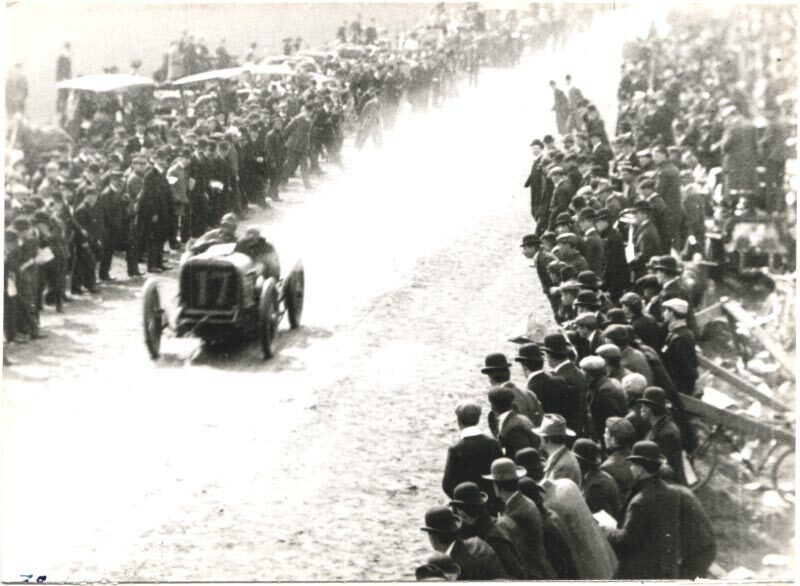 The primary reason for automobile manufacturers to invest in expensive racing cars and participate in the Vanderbilt Cup Races was to promote their product lines. 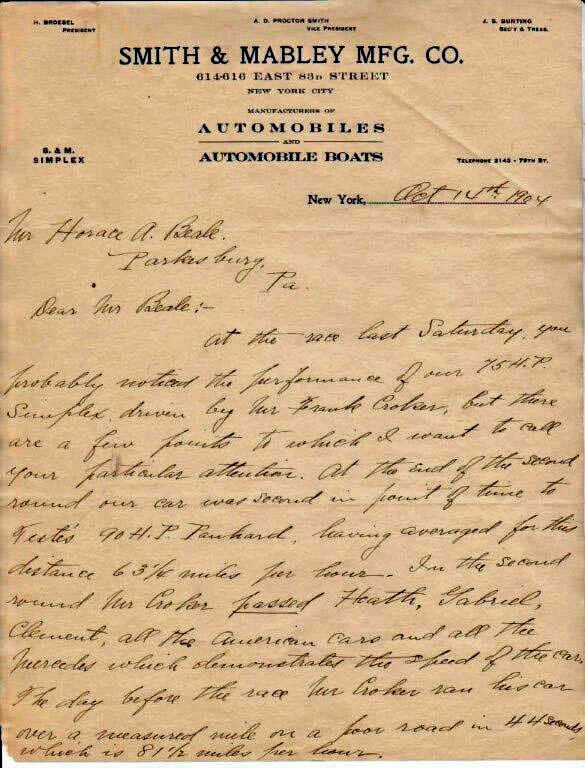 As an example, one week after the 1904 race, Joseph S. Bunting, secretary and treasurer of Smith & Mabley Manufacturing of New York City, sent a four-page letter to a prospective wealthy buyer, Horace A. Beale, owner of the Parkesburg Iron Company. John Cuocco has transcribed the four pages and I have added some notes. At the race last Saturday, you probably noticed the performance of our 75 H.P. Simplex driven by Mr. Frank Croker, but there are a few points to which I want to call your particular attention. At the end of the second round our car was second in point of time to Teste's 90 H.P. Panhard, having averaged for this distance 63- 1/4 miles per hour. 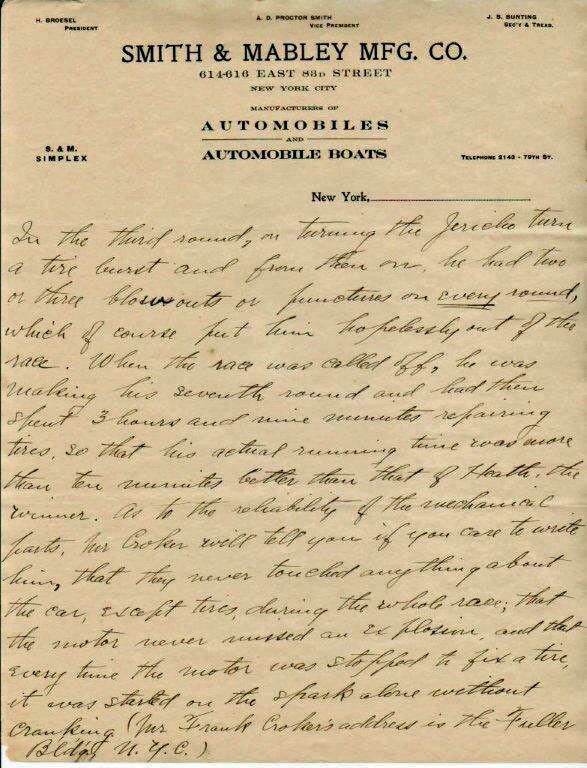 In the second round Mr. Croker passed Heath, Gabriel, Clement, all the American cars and all three Mercedes which demonstrated the speed of the car. The day before the race, Mr. Croker ran his car over a measured mile on a poor road in 44 seconds which is 81 -1/2 miles per hour. 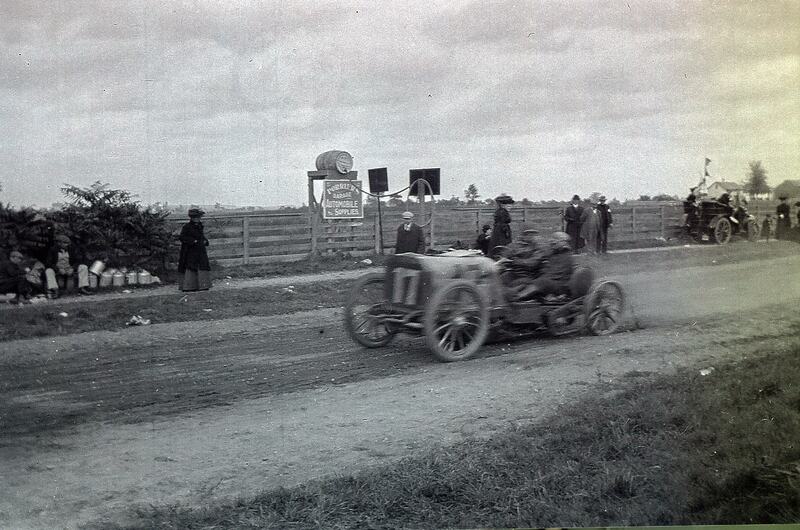 At the end of Lap 2, the Simplex was running third behind George Teste's Panhard and Fernand Gabriel's De Dietrich. 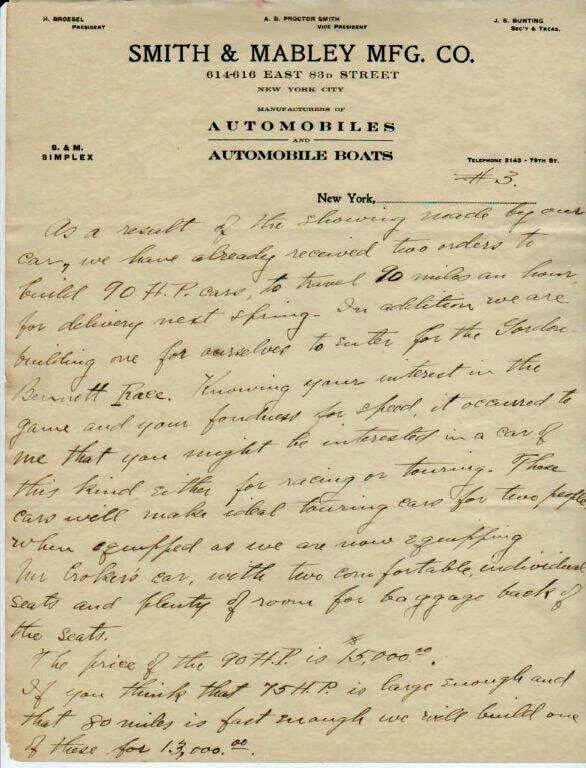 Note the Smith & Mabley's letterhead: "Manufacturers of Automobiles and Automobile Boats". In the third round, on turning the Jericho Turn a tire burst and from then on he had two or three blow outs or punctures on every round, which of course put him hopelessly out of the race. When the race was called off, he was making his seventh round and had their spent 3 hours and nine minutes repairing tires, so that his actual running time was more than ten minutes better than that of Heath, the winner. 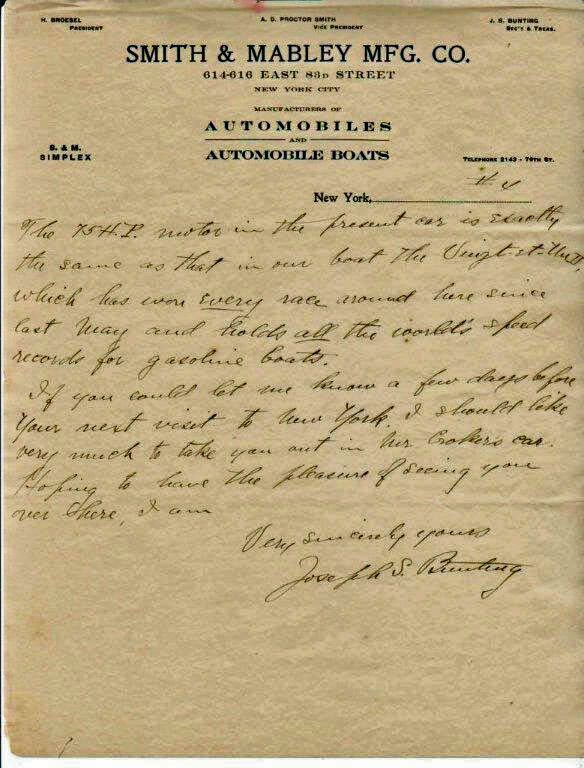 As to the reliability of the mechanical parts, Mr. Croker will tell you if you care to write him, that they never touched anything about the car, except tires during the whole race; that the motor never missed an explosion and that every time the motor was stopped to fix a tire, it was started on the spark alone without cranking. (Mr. Frank Croker's address is the Fuller Bldg, NYC). 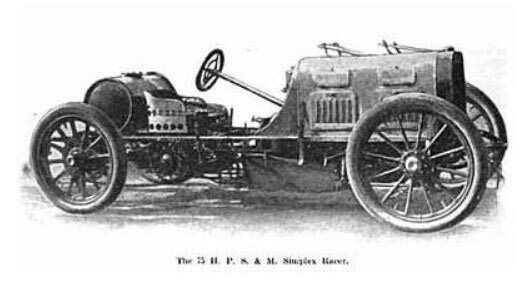 Croker's Simplex finished 9th in the 1904 race, averaging only 29.9 mph when the race was stopped. As a result of the showing made by our car, we have already two orders to build 90 H.P. cars to travel 90 miles an hour for delivery next spring. In addition, we are building one for ourselves to enter for the Gordon Bennett Race. Knowing your interest in the game and your fondness for speed, it occurred to me that you might be interested in a car of this kind either for racing or touring. These cars will make ideal touring cars for two people when equipped as we are now equipping Mr. Croker's car with two comfortable , individual seats and plenty of room for baggage back of the seats. The price of the 90 H.P. is $15,000 , If you think that 75 H.P. is large enough and 80 miles is fast enough we will built one of these for $13,000. $15,00o in 1904 is the equivalent of $370,000 today. $13,000 in 1904 is the equivalent of $320,000 today. 75 H.P. 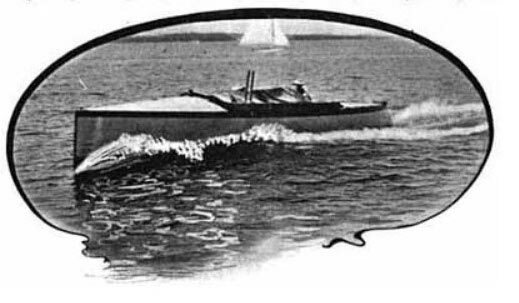 motor in the present car is exactly the same as that in our boat the Vingt-et-Un II, which has won every race around here since last May and holds all the world’s speed records for gasoline boats. There is no evidence that Beale ever purchased a Simplex. The same engine was used in the 1904 Simplex racing cars and motor boats. More information on the Vingt-et-Un II "automobile boat" can be found at the thunderboats.org website. Link to more information on the Simplex. Locomobiles through 1912. Your readers can see more of his cars on The Old Motor.